Annual herb to 1 m tall Stem: erect, one to several. Leaves: many, 1.5 - 3.5 cm long, lance-linear, three-veined. Flowers: borne on a loose terminal inflorescence, having five sepals 7 - 9 mm long with a pointed tip and five blue petals 10 - 15 mm long. The inner sepals are toothed and minutely hairy along the dry papery margin. Fruit: a capsule, 6 - 10 mm long, nearly spherical and abruptly short-beaked, incompletely splitting into ten segments with pointed tips. 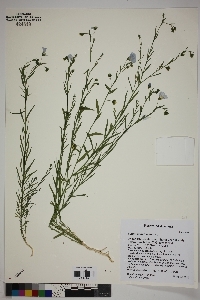 Similar species: Linum perrenne and Linum usitatissimum both have blue petals and wider fruit (5 - 10 mm) than the other Linum species in our region. Linum perenne differs by its perennial life cycle, multiple stems, toothless and hairless sepals, and leaves that are single-veined or three-veined only near the base. Habitat and ecology: Introduced from Europe and cultivated for seed and fiber, this species grows near grain elevators and railroad ballasts or in waste ground. 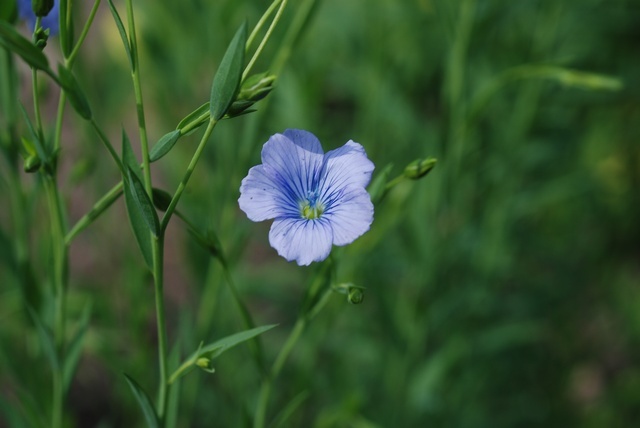 Etymology: Linum is the Latin name for flax. Usitatissimum means "most useful."